A few weeks back, a friend and I took a trip to photograph fall color in Michigan's Upper Peninsula. It was a trip we had been planning for about a year and we were sure that we had the timing of the whole color thing all figured out. How wrong we were! We drove to Munising, Michigan on September 29th and returned October 7th. That should have been smack dab right in the middle of peak fall color. But sometimes Mother Nature simply has other plans, and that was the case this year when the fall color season started about two weeks late. It very much reminded me of my trip to the Smokies for spring wildflowers about five years ago. We had also planned that one for what was usually the peak season. That year the spring was exceptionally warm and by the time we arrived the flowers had come and gone. The long and the short of it is that there was minimal fall color when we arrived. So what to do? Same thing as when the flowers came early. To quote my teacher, the late Nancy Rotenberg, 'take the gift you are given'. So did we have a great time? You bet we did! Besides the trees we had come to see there were tons of waterfalls, lakes, and forest scenes......all waiting for us to capture them in photographs. 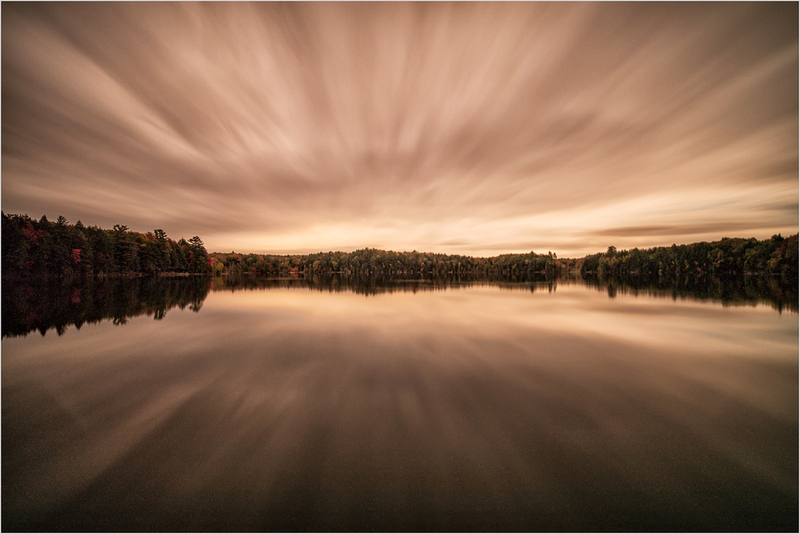 This particular image is a long five minute exposure of Pete's Lake near sunset. The long exposure, made with stacked neutral density filters over the lens, is what gives the clouds their streaked appearance. They move during those five minutes, streaking out over the sensor. These long exposures also tend to impart a warm color temperature resulting in the image's sepia tone. All in all, it was a great trip with or without the colors. The day before we left the reds and oranges finally seemed to bloom, so we got one day of fall color shooting as well as everything else.....the best of both worlds!